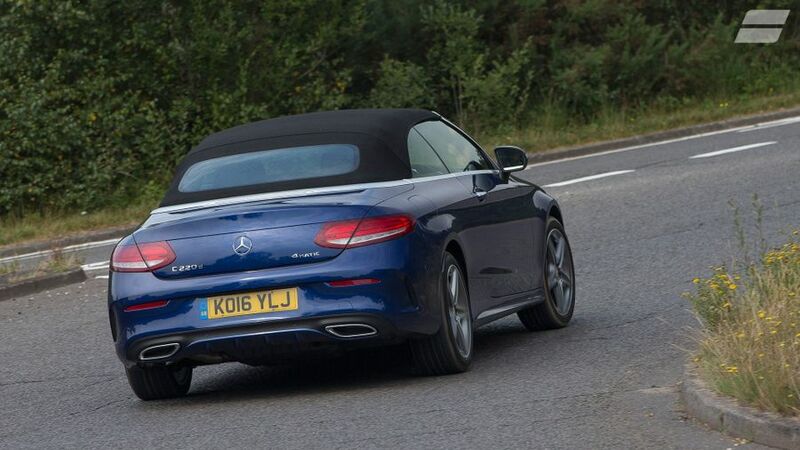 The Mercedes C-Class Cabriolet is a very well executed open-top version of the excellent coupe. Its shrunken S-Class looks, superb cabin and wide engine range give it a fantastic spread of abilities, while the impressive refinement and efficient diesels should make it easy to live with. You need to specify the optional air suspension to make the car as smooth-riding as it should be, but provided you do, this is one of the best big cabriolets you can buy. Making a four-seat convertible look elegant is a tricky business, but Mercedes has just about pulled it off with the C-Class Cabriolet. You can have that cloth roof in four different colours, although it still seems a touch ungainly stretched out over such a long cabin. However, the car looks superb with the roof down, with sharp lines, fine proportions and the kind of desirability normally found on cars twice the price. Sport models get a single-bar grille, 17-inch alloys and plenty of chrome trim, while AMG Line models up the ante with a sportier body kit, bigger wheels and an intricate diamond-effect grille. Full-blown AMG versions have wider wheelarches, huge brakes and four exhaust pipes, for the ultimate in showing off. The rest of us can express ourselves more subtly with one of the 13 paint colours, and there are a couple of optional exterior styling packs, too, such as the Night Package, which – you guessed it – turns most of the exterior trim black. Few interiors deserve to see the light of day as much as the cabin of the latest C-Class, and anyone peering into the Cabriolet will be suitably impressed by what they find. All versions have dense-feeling soft-touch materials, spiced up by plenty of metal-effect, black or wood inserts. The simple, clutter-free design looks good, and is fairly logical to use, while the switches, buttons and dials are tactile and precise. Our only gripe is with the infotainment screen, which looks like a touch-screen (but isn't) and seems like a bit of an afterthought sticking up from the centre of the dash. The standard sports seats are comfortable and supportive, and will accommodate all shapes and sizes of driver. With standard electric adjustment for the seats and, on automatic versions, the steering wheel as well, it's easy to find a comfortable driving position. The view to the front is excellent, but with the roof up, you'll struggle to see much out of the narrow rear window, so the standard parking camera could be a real lifesaver. 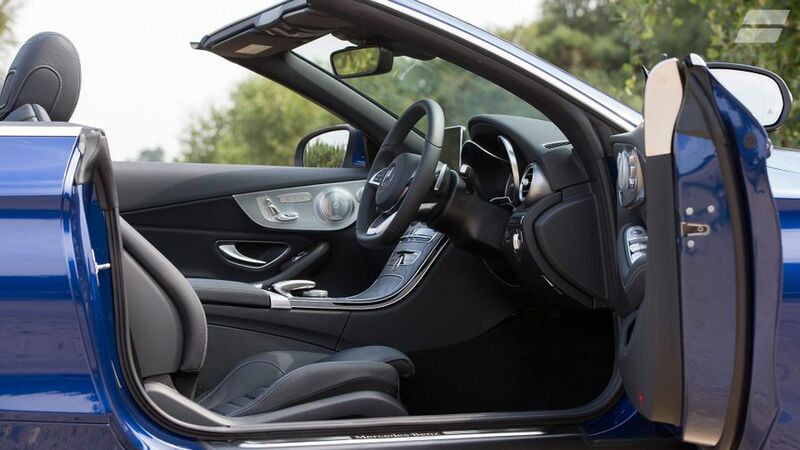 Practicality is probably not high up the list of priorities for four-seat cabriolet buyers, and it should go without saying that this car provides even less boot space and rear headroom than the C-Class coupe. Still, compared to rivals like the BMW 4 Series and Audi A5, it gives a better account of itself. The cabin is dotted with deep pockets for loose items, the door bins are sculpted to take a couple of cans or bottles, and the glovebox is good for more than just the handbook. Climbing in and out of the rear seats is a lot easier with the roof down, as the long doors and narrow windows mean you only have a very narrow gap to squeeze through with the roof up. Once you're in, kneeroom is not too bad, but adults sat in the back will have to slouch if they don't want their heads pressing into the roof. Boot space also depends on whether you have the roof up or down (360 and 285 litres, respectively) but the load bay is fairly shallow and awkwardly shaped, limiting the type of things you can carry. The Cabriolet has a variety of suspension setups depending on which version you go for, with most cars sitting slightly lower than the equivalent C-Class Saloon. We haven’t yet tried a model in Sport trim, but we have tried an AMG Line version, which gets a lowered setup. To be honest, it’s not that great. It feels slightly jittery over an uneven surface, and big bumps and potholes give you a proper whack in the backside, and cause the car’s bodywork – which is less rigid than the Coupe’s due to the loss of the solid roof – to shake and flex. We’ve also tried cars on air suspension, which is standard on faster versions and optional on a variety of others, and it’s much more like it. This setup gives the driver three modes to choose from, so in 'Comfort' you get a soft, floaty ride, but you can crank up the stiffness to sharpen the handling when required. Rear-wheel drive versions have plenty of grip and feel composed, but the four-wheel drive cars feel even more secure on the road, and give the C-Class some useful all-weather ability. The hottest C63 AMG models have so much power that they can feel like a handful, but keep the stability control in its 'Sport' setting, and you can have fun without taking huge risks. There are several steering setups, depending on the model you pick, and while none offers much feedback, all make it easy to place the car confidently on the road. There's a C-Class cabriolet to suit everyone – no matter how fast you want to go – and the engine range kicks off with a pair of 2.1-litre diesels, the C220d and C250d. Both feel flexible and provide decent performance; and, while the 250d feels noticeably faster, the 220d is no slouch. It's worth noting, though, that the 220d comes with a clunky six-speed manual gearbox, while the 250d has a smoother and more refined nine-speed auto. Still, neither engine is especially hushed, and when worked hard, they sound particularly gruff and vocal, something you notice a lot more with the top down. 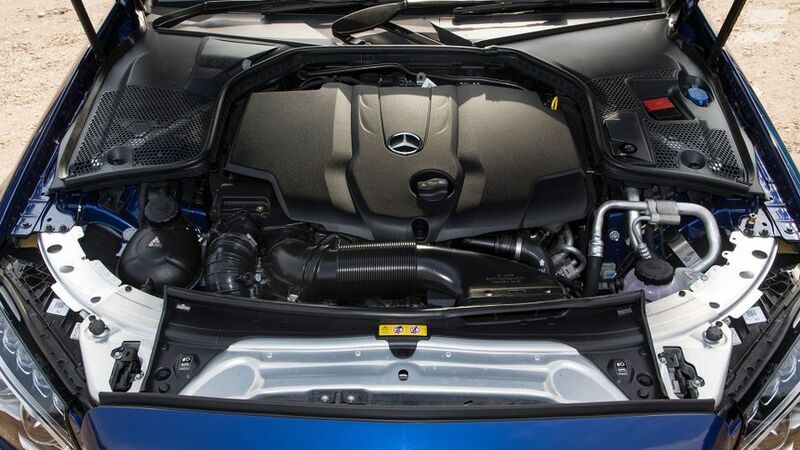 Those after a smoother, quieter experience might opt for the 2.0-litre petrol in the C200 or even the C43 AMG, which has four-wheel drive and takes just 4.8 seconds to cover the 0-62mph sprint. True enthusiasts will probably be more interested in the C63 and C63 S AMG versions, which feature a blisteringly quick 4.0-litre twin-turbo V8 and provide searing straight-line acceleration and a wonderful, rumbling exhaust note. These AMG models get a tougher seven-speed transmission, which is quicker at flicking through the ratios, although the engines pile on speed so fast that it's quite easy to hit the rev-limiter at speed. With such a broad range of engines to choose from, there's obviously a fairly wide spread of running costs for the C-Class Cabriolet. However, due to its hefty weight, the drop-top will be the most expensive version of the C-Class to run day-to-day, regardless of the engine you pick. Even so, the diesels are both impressively efficient, and the cleanest model – the C220d with a manual gearbox – will return an official 62.8mpg and produce only 116g/km of CO2. That figure goes up by degrees if you add larger alloys, an automatic gearbox and four-wheel drive, but even the version with all three emits just 140g/km of CO2. The quicker C250d is only slightly thirstier, but the petrol C200 and C300 will cost you more to tax and fuel, with official economy figures closer to 40mpg. It should go without saying that the C63 AMG models are both vastly more expensive to buy, run and insure, with fuel economy in the low twenties a daily reality. In general, the C-Class Cabriolet is a little pricier than its rivals, but also comes with more standard equipment.The quicker C250d is only slightly thirstier, but the petrol C200 and C300 will cost you more to tax and fuel, with official economy figures closer to 40mpg. It should go without saying that the C63 AMG models are both vastly more expensive to buy, run and insure, with fuel economy in the low twenties a daily reality. In general, the C-Class Cabriolet is a little pricier than its rivals, but also comes with more standard equipment.  As a brand, Mercedes currently sits fairly low down in Warranty Direct’s manufacturer standings for reliability. Still, that puts it right alongside most of its premium rivals, with both the cost and frequency of repairs enough to upset the drivers who were surveyed. However, the C-Class doesn’t do too badly at all in the same survey, and our owner reviews on this site support that picture, with the previous saloon widely praised for its durability. Although there has never previously been a C-Class Cabriolet, Mercedes has plenty of expertise when it comes to building the complex mechanisms involved, so we have no worries over the durability of the roof. As standard, the cabriolet comes with a three-year warranty that covers you for up to 100,000 miles, which is on a par with what you'd get from Audi or BMW. Just like the Coupe, the open-air C-Class comes with a cast array of safety equipment. It includes a system to warn you that you're too tired to drive, another that will brake automatically at low speeds in emergencies, and hoops that pop up if the car rolls over, protecting your head and neck. The saloon version of the C-Class received the maximum five-star rating from Euro NCAP, and the good news is that the Cabrio matched that performance when it was tested independently. Cruise control, a reversing camera, seven airbags and tyre-pressure monitors are all standard. However, if you want extra electronic safety nets, there are loads to choose from, including lane departure warning, adaptive cruise control, and a set of 360 degree-view cameras to make you a parking maestro. This is an area where the C-Class starts to justify its high price. There are only two trims to choose between, but both come with a whole heap of standard equipment. Sport models feature sat-nav, LED head- and tail lights, a reversing camera, artificial leather heated sports seats with memory function, keyless entry and plenty more. 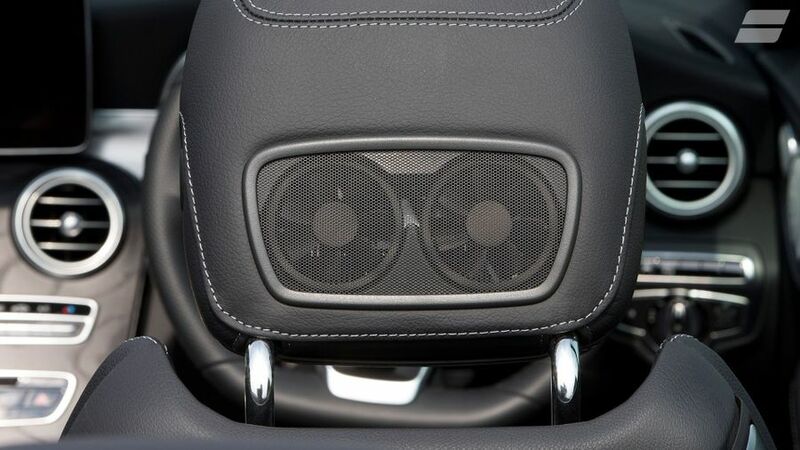 The Cabriolet gets a couple of unique features, too, with every model getting heater vents in the headrests to keep your neck warm, and an air deflector that pops up from the windscreen. Choose to spend a little more on the AMG Line model and you'll also be treated to a flat-bottomed steering wheel, attractive black ash wood trim on the dashboard and a sporty body kit. The options list is extensive, but there are a number of packs which offer better value by throwing several choice extras together. The Premium Plus pack, for example, includes the excellent Burmester stereo and upgraded COMAND infotainment system with a much improved sat-nav. It's definitely a worthwhile investment, if you can afford it. If you want a luxurious, refined four-seat cabriolet that exudes class and sophistication, then the C-Class should be close to the top of your list. It has stylish looks and a stunning cabin, while the smooth automatic gearbox makes it relaxing to drive, and the hottest AMG models have searing performance and bags of character. Obviously, this is not the most practical version of the C-Class, but it's easily the most glamorous, so only extrovert buyers need apply.